Kelly’s post on “wasting time” with a creative hobby reminded me of my failed crafting attempts. It probably all started as I really started to get into Pinterest a year or so ago, and saw ALL THE THINGS I could make or do. The problem (for lack of a better word) is that I didn’t need any of the stuff I was creating. So what should I do with it all? There are only so many people you can give weird crafty things to as a present, so they just become worthless clutter. And clutter is something I’m trying to reduce in my home, despite the fact that it seems to just breed. And despite the fact I’m not an excessively tidy person. Naturally my mind skipped straight to local markets with an “oh man, I could sell this”. I started looking into local markets; the days and times they were open. The legal requirements such as public liability insurance. Market regulations about signage and stall size. I also started looking online at Etsy and MadeIt, with all the rules and obligations that come with those sites too. Let alone PayPal to receive any money online! And in the end I had no desire to craft. I had turned it from a hobby into a pressured obligation, before I even took it anywhere. Now, this is probably a bit to do with my amazing shiny object syndrome, but it also stems from producing things that have no value to you personally. I’ve been asked many times (outright harassed on one occasion) about why I’m not a photographer. And when it comes down to it, I’m just not all that interested in most types of commercial photography. 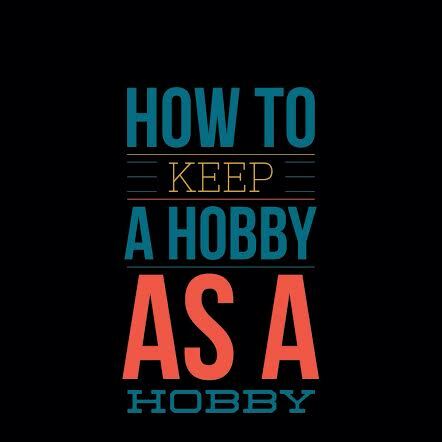 So how do you keep a hobby as a hobby? In all honesty, I’m not sure if there is one answer. Perhaps I just haven’t found the right craft for me. Perhaps I need to just let it be whatever it is after it has been and then throw it out. Maybe the actual creative process is more important than what is created. Maybe I just need to control my shiny object syndrome. Do you craft anything? What do you do with it after? Do you feel pressured to sell anything you have skills in? That’s a huge problem with crafting isn’t it?! It creates ‘stuff’!! I wish I had a useful suggestion for getting around the stuff problem because it does kinda take the fun out of being able to do it as a hobby doesn’t it? So much stuff! The only solution I’ve found so far is to do any sort of drawing or painting a spiral-bound pad. At least that way it all stays together. I scrapbook, but I have a cupboard full of half-finished ones for myself (and the kids). The only ones I ever finish are those as gifts for others, because there’s a deadline. Deadlines make me do stuff. Scrapbooks must be good because at least it’s self-contained. I sometimes think turning your hobby into a business that kills your passion. Some people seem to manage it though. I was a scrapbooking product consultant for a while but I realised I was a much better customer than a salesperson. I keep it as a hobby now! I guess there needs to be a level of distance between you and your business, so that makes it harder to turn a hobby into a business. One of my friends does Photography as a hobby and she takes really nice photos. I asked her once when she didn’t do anything professional and her response was similar to yours. She liked to keep it as a hobby because it meant that she could take photos of things and people she wanted, in ways that she wanted to. There was no pressure from parents (most of her photos are of her friends kids) to get that perfect shot. I think commercial photography in particular is a hard place to be these days. There’s a lot of value in a good photographer, but what I would hate is the constant justification of my worth – if I went commercial it would be expensive in the hopes of people having made a decision that they want a photographer before they come to me.